It's 8 o'clock on a Sunday night and Fats Waller's 1939 hit "You Meet the Nicest People in Your Dreams" is bounding out of your speakers. In 2006, that can really only mean one thing: "The Big Broadcast," WFUV-FM's weekly, four-hour celebration of 1920s and '30s jazz and pop, is on the air. 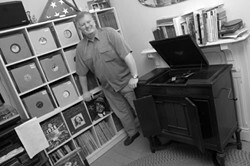 On the other end of the signal, old-time meets high tech as the show's vivacious host, Rich Conaty, holds forth from the gleaming studio's ultra-modern console, taking requests via e-mail and spinning rare 78s from CDs he's burned at home. The program has been kicking and crooning across the New York airwaves for close to 35 years, and tonight's installment is highlighted by birthday tributes to lyricist Gus Kahn and Chicago cornetist Mugsy Spanier. Conaty plays an ethereal waltz, then a bouncy dance band track featuring suave vocalist Scrappy Lambert. But then it's time to heat things up. "Get a load of this— 'Cloey' by Henry 'Red' Allen's Orchestra, from 1936," he announces. As Allen's steamy trumpet and shuffling rhythms send listeners to the stratosphere, Conaty grins wide and bops his head in time. While a few other left-of-the-dial shows do feature Depression-era sounds, you'll have a hard time finding one that does it as regularly—or with such deep love for and knowledge of the music. It's easy to understand why "The Big Broadcast" is one of New York radio's longest-running, fanatically followed programs. Those who believe pre-World War II American popular music is strictly the stuff of goofy, old cartoon soundtracks and "Little Rascals" episodes are way off. After all, early jazz was outlaw fare, the syncopated clatter of the bathtub gin-wrecked Daisy Buchanans and wannabe mobsters who rocked the Charleston in smoke-filled speakeasies. It's the bold realm of musical revolutionaries like Louis Armstrong, Jelly Roll Morton, and Bix Beiderbecke. Of peppy, proto-garage bands like Ben Bernie's orchestra and the Mound City Blue Blowers; of sweet crooners like Rudy Vallee, Russ Colombo, and a hip upstart named Bing Crosby. And it's the sophisticated, dream-like domain of the Gershwins, Cole Porter, Irving Berlin, and other legends of the Great American Songbook. Truly a magic time, one to match any segment of the subsequent rock 'n' roll decades. Listening to "The Big Broadcast" (named for the 1932 film starring Crosby and others), it's hard not to be swept up by Conaty's boundless enthusiasm. An affable kid in a 52-year-old's body, he grew up in Queens, where the Jazz Age bug bit him early and hard. "I was 13 or 14, and I was fishing around on the radio and found this show on the Hofstra University station out of Long Island that played these old records by the Mills Brothers, Paul Whiteman's Rhythm Boys [with the youthful Crosby]," he recalls. "Hearing that is what got me interested in both the music and in radio." By the time he was 16, Conaty had his own show on the very same station. So in 1971, while his fellow high school students were banging their heads to Led Zeppelin, Conaty was tapping his toes to Ukulele Ike. Didn't the other kids give him a hard time? "No, they dug it," he says. "They liked me because I was different, and I was on the radio. That was kind of a big deal to them." On one occasion, for show-and-tell, he was even asked to bring in some of his vintage records to play for the class. When it came time to pick a college, however, he chose Fordham, not Hofstra, "more on the strength of its radio station's signal than any academic consideration," he says. And though the show did run briefly on another station, it's Fordham's WFUV that has been home to "The Big Broadcast" for the majority of the years since its January 1972 debut. At the time Conaty began his radio career, many of the great entertainers of the early days of recording were still active, and he was lucky enough to see several of his idols perform and even meet a few of them. "I got to see Bing and the Mills Brothers in person, interviewed the two surviving Boswell Sisters, spent an evening listening to Tin Pan Alley tales from 'Star Dust' lyricist Mitchell Parish," he recounts. And while meeting band leader Ben Selvin and hiring Arthur "The Street Singer" Tracy to play his wedding were also high points, it's Conaty's interview with Cab Calloway that is perhaps his most memorable encounter with one of his heroes. "I don't drink now but back then I did, and Cab got us both drunk," he says, smirking and rolling his eyes. "CD players were still kind of new then, and he'd just gotten one. He was really excited about it, like a kid with a new toy. He figured because CDs were taking over he wouldn't need his old records anymore, and he gave me a whole bunch of really rare ones. 'Let the kid have 'em,' he said." Conaty moved to Hudson in 1998, where he buzzes around in his immaculately restored 1950 Nash Ambassador and shares a townhouse with several thousand 78s and his two cats, Yoda and, yes, Scrappy. But if Conaty and the kitties are stuck in a time warp, they're not alone. Thanks to the World Wide Web, "The Big Broadcast's" listenership has exploded, and the DJ regularly gets e-mail and fund-drive pledges from as far away as North Carolina, Colorado, California, even Australia and New Zealand. Oh, and anyone who thinks this nearly 100-year-old music is only for the Dockers-and-Depends set should pay a visit to the maestro's MySpace page (www.myspace.com/richconaty), which gets upward of 1,000 hits a week and sports a colossal friends list heavy with 20-something, Louise Brooks-worshipping hotties and handsome, tuxed-and-tailed old-time jazz combos. "Rich really puts a lot of thought into each show," says Vince Giordano, leader of Vince Giordano's Nighthawks, perhaps the most revered of all contemporary 1920s-style jazz orchestras. "He puts together a great mix. He doesn't just play one Ruth Etting tune or one Bix tune after another. And he keeps it interesting, he gives you just enough facts about the songs, the records." Giordano, whose band has been featured on the soundtracks of Ghost World and The Aviator and recently recorded music for a forthcoming Robert DeNiro film, The Good Shepherd, has been a top draw on the New York club scene since the late '70s. Conaty's even gotten into the record business himself, in a way. 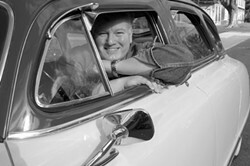 In 2005, he put together a compilation CD for the Rivermont label bearing the program's name and featuring such on-air favorites as "Goin' to Town" by Red Nichols and His Five Pennies and "Happy Rhythm" by the Musical Stevedores, as well as rare tracks by the orchestras of Calloway, Fletcher Henderson, and Barney Rapp. The follow-up, The Big Broadcast, Volume 2 (which includes a scarce 1927 recording by Kenneth Casey and His Orchestra yours truly rescued from a Kingston thrift store) has just been released. When asked what it is that makes this antique music special, what gives it such lasting appeal, Conaty inhales deeply and holds his breath for a few seconds. His brow wrinkles, his eyes narrow. "There's a real honesty to it. It has energy. It has wit, there's an intelligence to the writing. The solid playing of the bands just makes it all work, it makes the music hang together," he says. "There's a tune on The Big Broadcast, Volume 2, 'I Get the Blues When it Rains' by Fred Rich and His Orchestra," he continues. "It's just a dance band record, a stock arrangement done for a cheap label. At first you're listening to it and the band's just sort of going along, no big deal. And then, all of a sudden, the Dorsey Brothers [Tommy, trombone; Jimmy, clarinet and alto sax] come in—these rowdy, Irish-American guys just muscle their way in like they just can't wait to get in there and jazz it up. Stuff like that just gives the music this incredible momentum." A momentum sure to carry Rich Conaty and "The Big Broadcast" through another 35 years. At least. "The Big Broadcast" airs on WFUV-FM Sundays from 8pm to midnight and streams live at www.bigbroadcast.com. The Big Broadcast and The Big Broadcast, Volume 2 CDs are available from www.rivermontrecords.com. Conaty tours Hudson in his 1950 Nash Ambassador Custom. Sultan of Surface Noise: The DJ's living room is home to his Victrola and formidable record collection.